Today is World Oceans Day. The right thing to do, I suppose, would be to write my own World Ocean’s Day post. But to be honest, I feel like devoting one annual day to Earth Day, or Oceans Day, is a pretty pathetic response to the magnitude of the damage our little comfort and consumer-obsessed species is doing to both the wet and dry parts of the planet every single day. So if an annual day makes anyone feel like they are somehow absolved from all their usual ocean-killing habits and priorities–because they gave up fish for lunch, or sent out a tweet–and no one really changes their behavior in a big way, then it is sort of pointless, isn’t it? Every day should be Oceans Day, if you think about it, because it is our everyday actions that are the problem. And if we could somehow manage to think about the consequences of those actions every day, then that would be something revolutionary. But most people don’t. They acknowledge Oceans Day for a day (if that) and move on. 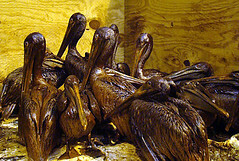 And then when BP blows out a deepwater well and pumps an unimaginable amount of oil into one of he world’s most valuable and fragile ecosystems there is a paroxysm of anger and complaint. But that outcry would only be exceeded by the blowback and outrage we would hear if, say, President Obama and Congress moved forward on a real carbon tax, or simply asked the nation to stop air conditioning its homes and offices at near-frigid temps in the summer, and tropical highs in the winter. Our collective and cultural awareness, and willingness to make sacrifices in response, is just completely, completely out of synch with the actual demands of the problem. Whew. That’s depressing, which is another reason I thought it best not to write about World Oceans Day (though somehow I just have). 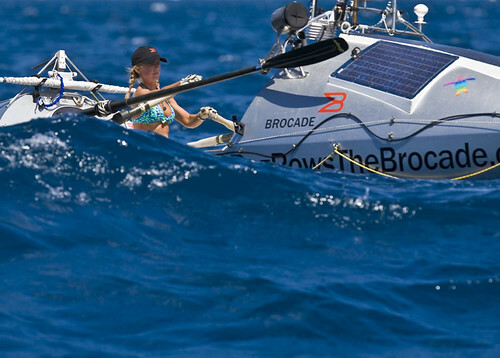 Anyhow, what I intended was to let Roz Savage (who is not a dismal, Wetass-class, pessimist, and is, instead, a fantastic, ocean-rowing, phenomenon) tell you about World Oceans Day, because I liked her blend of urgency and hope that it is not too late to act. Until this year, I felt uncomfortable when people tried to label me as an “advocate for the oceans”. It wasn’t a label I had chosen, and I felt it didn’t fit me. The Atlantic Ocean beat me up pretty badly in 2005-6, and I was still bearing a grudge. My relationship with the ocean could best be described as ambivalent. I regarded her as a tough taskmaster, who occasionally tried to kill me. Not the best basis for a happy relationship. But this year two things have happened that have softened my attitude towards the vast blue bits of our planet. First, there was TED Mission Blue. For two days I received a concentrated dose of all the bad news that I had heard about the oceans over the last few years, and it shocked me. 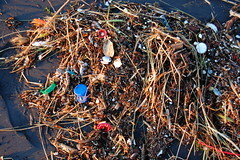 – There is a 6:1 ratio of plastic to plankton in the ocean. This cannot be good. – Consuming blue fin tuna is like barbecuing pandas. – Ocean plants produce half of the world’s oxygen. – In 40 years, seafood could be a thing of the past. – Ocean acidification is seriously affecting its ability to absorb CO2 from the atmosphere. Sure, I already knew about plastic pollution, collapsing fish stocks, ocean acidification, dead zones and coastal habitat destruction. But like so many environmental messages, the drip-drip-drip of bad news hadn’t really hit me with the sense of urgency that I got at TED. Here were world-respected experts telling us that we need to take urgent action before the oceans are too damaged to recover. Given that the oceans cover 70% of our planet, it suddenly made sense to me that if our oceans are in trouble, then so are we. So on this Oceans Day, even if you have never spent a day at sea in your life, I beg you to do a blue deed for the day. Do something to help. Join an ocean conservation organisation. Make a donation. Post a tweet. Just do something. And then tell us about it at http://ecoheroes.me. Log a “water” deed and tell us what you did. The ocean thanks you. And so do I.
I do too, particularly if you resolve to log a “water deed” every day of the year. Now that would start making a real difference. And if that’s what you are ready for, then this day, and this post, won’t have been a waste at all. And if you want to join a community of citizens who are taking action on the oceans, then Oceana is an excellent place to start.